Gleam is basically a Lumines clone but for the Game Boy Advance. Use the VisualBoyAdvance emulator to run it on the PC. It runs quite smoothly although the playing area is slightly smaller compared to Mizuguchi's baby. 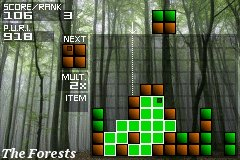 The inclusion of special blocks add an extra dimension to the gameplay.